Police officers block supporters of Russian opposition leader Alexei Navalny during a rally in Moscow, Russia October 7, 2017. MOSCOW - Supporters of jailed Russian opposition leader Alexei Navalny gathered in Moscow on Saturday, calling for President Vladimir Putin to quit and let Navalny run in an election. Under gray skies and intermittent rain, around a thousand Navalny supporters gathered in central Moscow’s Pushkin Square and chanted “Russia will be free” and “Russia without Putin”. Navalny, who is serving a 20-day jail term for violating rules on public meetings, called the rally in Moscow and other cities across Russia to coincide with Putin’s 65th birthday. Putin, who has dominated Russia’s political landscape for almost 18 years, is widely expected to run for what would be his fourth term in March. Others carried copies of the Russian constitution and posters citing their right to protest, some waved Russian flags, and a few carried inflatable yellow ducks, a jokey reference to the fact that Navalny accused Prime Minister Dmitry Medvedev of owning a lavish estate with a duck house. Medvedev called the allegations against him politically-motivated nonsense. The size of Saturday’s Moscow rally and others across Russia looked more modest than Navalny-backed mass protests in March and June which were widely recognized to be some of the biggest since 2012. A major rally was planned later on Saturday in Putin’s home town of St Petersburg. Putin remains popular across the country, especially outside major cities where his strong leadership style and tough foreign policy stance goes down well. He is expected to confirm in November or December that he will run again for another six-year term. 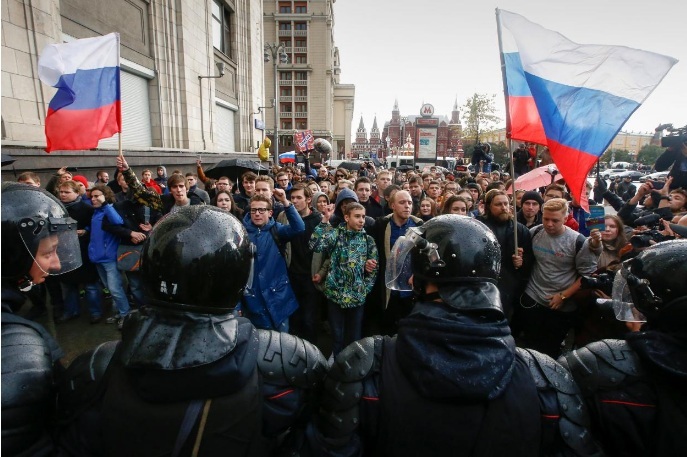 Moscow authorities had refused to approve Saturday’s rally. There were Russian media reports of one or two detentions, but a Reuters reporter said police largely showed restraint. Some of the protesters broke away and began to walk towards the Kremlin, but Red Square had been sealed off with barriers and riot police could be seen on standby nearby. It was a different story at a similar rally in the Urals city of Yekaterinburg however, where a Reuters reporter saw police detain at least eight people among a crowd of over 1,000 protesters. Evgeny Roizman, the local mayor, said that about 20 protesters had been detained, and Russian media reported detentions at other similar events in other towns.